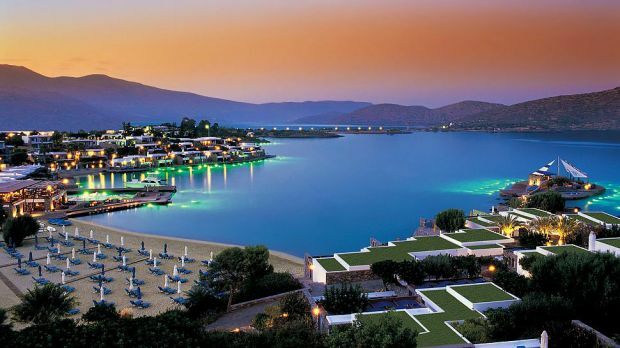 Elounda Beach Resort is located on the northeastern coast of Crete. 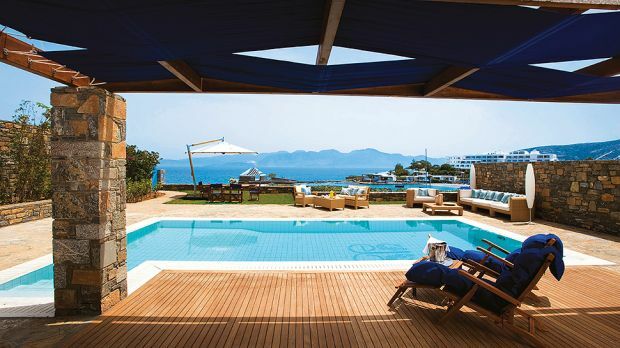 The hotel is a 50-minute drive from Heraklion Airport. Exclusive helicopter and private jet services and arrangements are available. First impressions are everything. At Elounda Beach Hotel on the gorgeous coast of Crete, the eye-catching modern exterior, with sweeping white roof and immaculate stone walls, doesn't deceive. Suites and villas are beyond luxurious - airy and spacious, they're built entirely around the magnificent Mediterranean view. For the height of decadence, book the ultra-swanky Yachting Club suite, featuring heated teak floors, leather ceilings, avant garde furniture, and video projector. Though you could remain blissfully content in your room, you'll want to get outside to stroll the secluded white sand beach, go windsurfing, or float in the salt water pool. And make sure to hit the hotel's spa for an Asian influenced Chenot massage. Elounda Beach is a place to relax and rejuvenate, but with eight restaurants named for Greek gods and myths, it's also a place to indulge. Whether you choose seaside snacks at the Argonaut or full-fledged hedonism at Dionyssos, the food and wine are legendary. 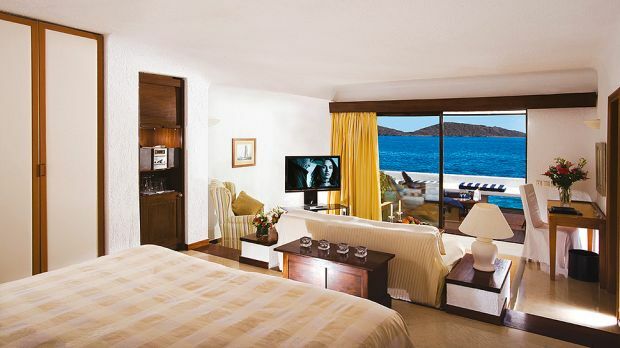 Send an availability request with your requested dates to the Elounda Beach Hotel. 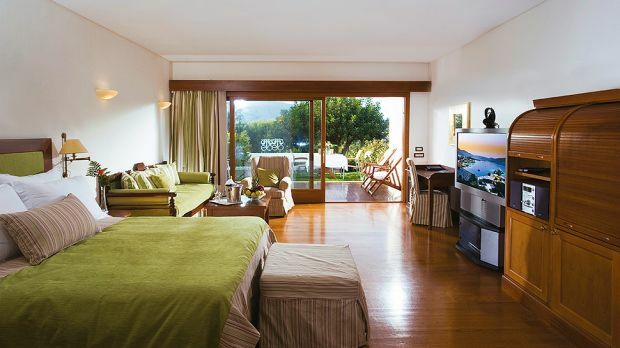 Located in the Elounda Building, the Classic rooms feature 1 King bed, balcony, Jacuzzi bath, shower overtub and daily American Buffet Breakfast. Classic Bungalow Sea View includes American buffet breakfast daily. Features 1 King bed with separate mattresses, a comfortable sitting area, marble lined bathroom with sunken Jacuzzi bath and steam shower and American Buffet Breakfast. Ground floor patio leading on to garden area. Connecting rooms for families available. 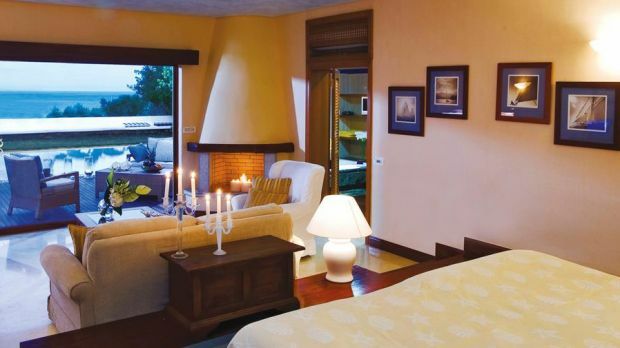 Features 1 King bed with separate mattresses, marble lined bathroom with sunken Jacuzzi bath and steam shower. Spacious balconies with panoramic sea views. Connecting rooms for families available. Features 1 King bed, comfortable sitting area, sunken Jacuzzi bath and steam shower, TV entertainment center, WiFi Internet, spacious terrace leading on to a pool shared between 2 or 3 other rooms. Includes daily American Buffet Breakfast and three-course a la carte dinner. Room with a Private Gym located on the ground floor of the Imperial building, a spacious bedroom with a dressing room and a bathroom with a Jacuzzi bath, a separate shower cabin with steam bath and TV, and a generously sized terrace and garden. Daily American Buffet breakfast and a daily credit towards dinner in your choice of a la carte restaurant. 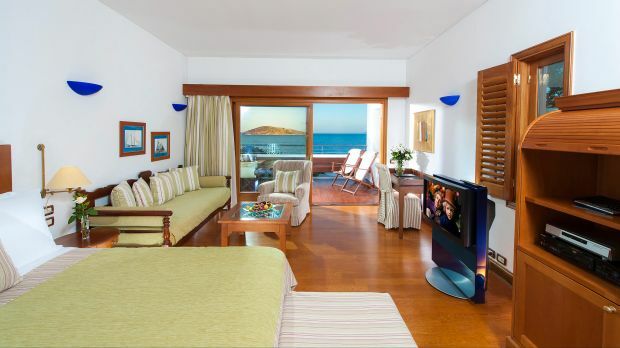 Suite with one bedroom, sitting room and sea views. Includes buffet breakfast daily. 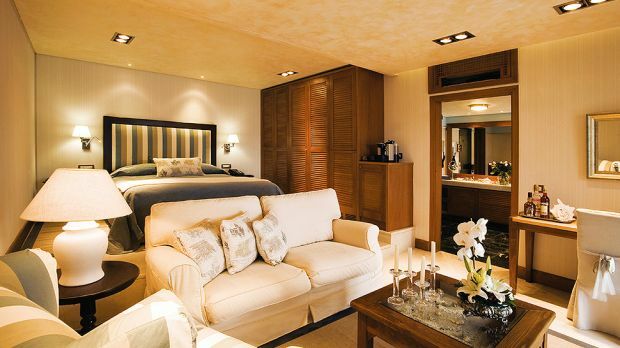 Suite with open plan bathroom with Jacuzzi bath and steam showers, spacious balconies. Includes American buffet breakfast and three-course a la carte dinner. Bungalow with direct sea access, 1 King bed, sitting area, Jacuzzi bath and complimentary daily breakfast and three course dinner in the restaurant. Luxury Bungalow Sea View features private pool, spacious patio, private gardens and American Buffet Breakfast daily. Island Suite on Waters Edge with open-plan bedroom, Jacuzzi bathtub, separate shower cabin, most with steam, entertainment center free WiFi. Large terrace offers access either to the beach or to a platform that is exclusive to the suites and leads directly to the sea. Includes daily breakfast. Deluxe Hotel Suite Sea View with open floor plan, bathroom with Jacuzzi bath and steam shower, balcony and includes buffet breakfast daily. Includes bedroom, sitting room, Jacuzzi bath and steam shower. Also includes American buffet breakfast and three-course a la carte dinner. Features 1 King bed with open plan lounge, Jacuzzi, bath, steam shower, direct access to sea platform, private gym in suite and buffet breakfast. 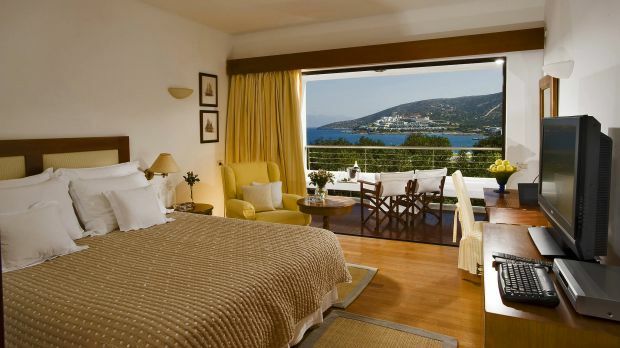 Deluxe Hotel Suite Sea View has two bedrooms, two bathrooms, joined by living room which can be used as third bedroom. Large balconies Daily breakfast and three-course dinner in a la carte restaurant included in rate. Ambassador Bungalow Suite with King bedroom, separate living room, Jacuzzi bath, steam shower, Spacious balconies direct sea access from platform sun beds and umbrellas. Daily American Buffet Breakfast and credit for dinner in resort restaurants included. Family Suite with sea views, two bedrooms and two bathrooms. Daily American Buffet breakfast a daily credit towards dinner in your choice of a la carte restaurant. Features private gym, direct sea access from platform, 1 King bed, lounge area, bathroom, Jacuzzi bath with steam shower. Daily American Buffet Breakfast. Villa features a private pool, 1 King bed, open plan sitting area (most with fireplaces), walk-in closet, marble-lined bathroom with Jacuzzi bath, steam shower, TV entertainment system, complimentary Wi-Fi Internet, spacious outside terraces and private parking area. 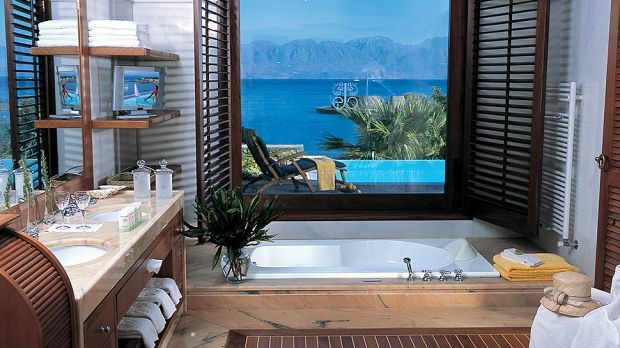 Premium Waterfront Junior Suite with private pool, King bed, open plan lounge, Jacuzzi bath, steam shower cabin. Platform with direct sea access Daily American Buffet Breakfast and three-course a la carte dinner included. Features 1 King bed, lounge, two bathrooms with Jacuzzi bath, steam shower, walk-in closet, spacious patio, direct access to the beach, and private heated pool. Two Bedroom Villa with separate lounge, ensuite bathrooms, Jacuzzi bath, steam shower,daily breakfast and direct sea access. Features private pool, 1 king bed, separate living room or open plan, marble-lined bathroom, Jacuzzi bath, steam shower and direct sea access. Villa boasts three deck areas, private swimming pool, spacious bedroom and living areas, and opulent bathrooms with sunken tub, heated floor and steam bath. Daily American Buffet breakfast and a daily credit towards dinner in your choice of a la carte restaurant. Features private pool, waterfront location with direct sea access, en-suite bathroom, Jacuzzi, bath, steam shower, separate living room and buffet breakfast. Villa with a private heated swimming pool, lush elegant private garden sea view, whirlpool, two bedrooms, living room - some with fireplace, two bathrooms, Jacuzzi tub, steam bath, separate shower, some with separate dressing room, TV in bathroom, some with kitchenette. Some with private parking area. Daily American Buffet breakfast and a daily credit towards dinner in your choice of a la carte restaurant. Family Villa with private heated pool, waterfront location, direct sea access, two bedrooms, ensuite, Jacuzzi bath steam shower, two separate living rooms (one can be used as 3rd bedroom) and Daily American Buffet Breakfast. Presidential Villa with four bedrooms, four bathrooms, a gym, two lounges, kitchen, dining area and private heated pool. Located on two levels. Two bedroom suite features indoor and outdoor swimming pools, marble bathroom with Jacuzzi bath, steam shower, lounge with fireplace, piano, dining area, kitchen, spacious patio and gardens and private parking area.